Donnelly & Murphy | Problem Solved. Right Here. Donnelly & Murphy has been serving the needs of the residents and businesses of Southwestern Ontario since 1930. Personal Injury, Insurance Defence, Estates and Mediations. Personal Injury, Insurance Litigation, Civil Litigation. Family, Wills, Estates & Estate Litigation. Donnelly & Murphy was established in 1930 by Frank Donnelly, K.C. He worked as a sole practitioner until his son, Jim Donnelly, came to practice with him in 1955. In 1959 they were joined by Dan Murphy and the firm has thereafter been called, “Donnelly & Murphy”. 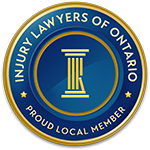 Donnelly & Murphy has been serving the needs of the residents and businesses of Southwestern Ontario since 1930. We practice in all areas of the law with a special emphasis on Civil Litigation, Real Estate, Family Law, Municipal Law, Criminal Law, Estates, Corporate & Business Law.